The variations of successful aquaponic systems around the world indicates their primary function works and works well; to grow fresh, pesticide free fish and vegetables at home. To successfully grow fish at home, you need a few tips to get it right the first time. So here they are. Some confusion about why backyard fish farming and aquaponics systems work is due to the many variables in any system along with very different climates and fish species. These differences are quite difficult for a new comer to understand and choose which is the best for their own requirements and expectations. If you are one of these enthusiastic new comers, welcome to an ever growing and very large and diverse group of people searching for that perfect fresh and healthy vegetable garden with an added bonus of your very own fish. The goal of aquaponics and successfully growing fish at home, is to use those fresh veggies grown in one of the many growing mediums, to make use of the nutrient provided by the fish and provide clean, filtered water for the fish in return. A simple and beautiful thing. Aquaponics is the simple process of feeding your fish to generate adequate nutrient from the fish wastes to have robust plant growth all year round, providing you do your best to stick to a manageable quantity of fish in your system. More people, now than ever, are trying out different stocking densities to get the maximum out of their systems and successfully grow fish at home. With the increase of fish and nutrient waste pressure on their aquaponic system, some have reached limits to where the fish are adversely affected. 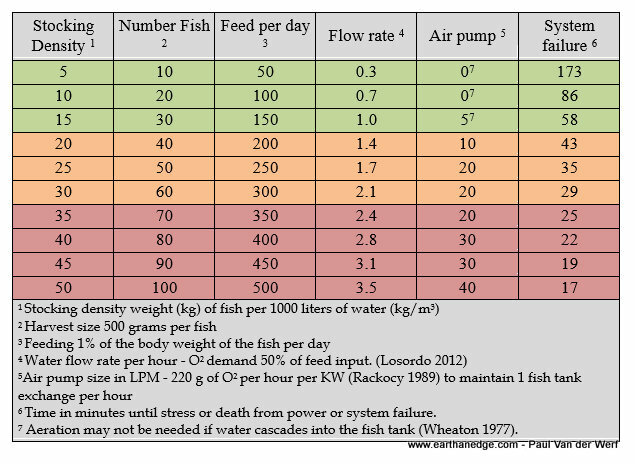 This can be easily avoided keeping in mind your fish production goals and matching adequate fish stocking and feeding loads. What Do Your Fish Expect of You? It is very rewarding to grow fresh fish at home and knowing where they come from. Very much like you and I, fish have some environmental requirements that are very simple to understand. In order of importance – appropriate temperature, plenty of oxygen, water quality, their favorite, high quality food and a comfortable stocking density. Meeting these five basic needs will see you go a long way to getting those fat, fresh fish to the BBQ and ultimately, to the table with a lovely side of salads and veggies. Getting the right temperature for you fish is quite easy if you select a fish that is native to your area but for those fish that are not, some heating or cooling may be required or possibly you grow them during a short winter or summer seasons. For example a cold water species in autumn to winter and warm water species in spring to summer. In general terms there are two main categories of fish (there are really 6…). The cold water group will do well anywhere between 10c and 22c and some of these will live in higher temperatures and the warm water (with a few tropical species) will do well between 22c and 30c, but like their cold water cousins some will still grow, be it slow, in lower temperatures. There a quite a few references available on the Internet for selecting the right fish species for you particular climate conditions and it is a good idea to check them out before you make your purchase. Fisheries and wildlife web sites are always a good source of accurate information or a quality reference book from the library. As not many will have access to a Dissolved Oxygen meter to know exactly how much oxygen is in their water, it is good to aim for 1 liter of air per 1 liter of water per 1 hour (16 to 20 liters per minute per 1000 liters of fish tank), if you are using aeration and a minimum water exchange of once per hour. Using an air pump and matching air stone diffusers is highly recommended but not necessary in low densities but good to have anyway. Some lower densities will have adequate aeration simply from the water being pumped or falling back into the fish tank. A drop or fall between 200 and 300mm is a good starting point for this method of aeration. To avoid tackling the individual needs of each species of fish and in depth discussion on their different parameters and how they are inter-related; the following basics will see you through well. pH – A pH between 6 and 8 will suit all species of fish and bacteria, no matter what part of the world you are in, though it is preferred to hold somewhere between 6.5 and 7.2. Alkalinity – You cannot miss keeping alkalinity between 80mg/L and 120mg/L if you are running purely aquaculture. In your aquaponic system you will find between 40mg/L and 80mg/L will see it perform well. Salinity – Your fish and bacteria will thrive while maintaining a salinity of 1 gram per liter. Salinity in aquaponic systems is best kept below 2 grams per liter. Nitrogen – Ammonia, Nitrite and Nitrate will be present in your system at any given time. Standard test kits are recommended as an inexpensive insurance and great for learning more about your water. They are especially important when first starting a system. Ammonia – At high feed rates you will always have trace Ammonia between 0.25mg/L and in warmer months up to as high as 1mg/L provided your pH is kept below 7.2 these readings will not give you any cause for concern. Nitrite – Nitrite will have peaks and troughs in any system but generally it will remain at 0mg/L or not readable with your tests kits. Provided your salinity is at 1 gram per liter you will have no concerns with this nitrogen source. If nitrite is persistently higher after cycling, check for solids build up somewhere in the system. Nitrate – Nitrate is what we are chasing to produce those healthy green plants. Keeping below 100mg/L should prove easy to do, if not add more plants! Avoid water exchanges and withholding fish food to lower the nitrate. Feeding your fish is the nutrient source for both your fish and your veggies in an aquaponic garden and it is the primary cause of all water quality issues. All fish if healthy and happy will consume 1% of their body weight each and every day. When they do not have access to that feed, they use their own stored and limited energy reserves to stay alive. Once those reserves are depleted, often within two to three days, the fish’s health will start to decline. While fish can go without feed for short periods of time, like you and I they suffer for it. If you stick to the basics you will never have need to withhold feed. Feed rates can sometimes be difficult to work out in the backyard and it is always a good idea to weigh your fish from time to time and adjust as needed, this is neither practical nor easy on you or the fish because fish do not like to be handled or chased about with a net! As most people will be feeding by hand a good tip for getting feed rates right is to weigh five handfuls of feed and average it to give you an indication the weight of your handful of food. Apply these small amounts in the morning and keep feeding these small amounts until they stop responding, try again in the afternoon to see if they are still hungry. This will give you how much feed they will eat in a day, you can then feed this amount in one feed or preferably over several feeds. Do this each month and adjust as needed. Avoid standing near the tank watching them, fish can be shy and some you may not see them eat the food if you hang about. You will never get it wrong with a good quality, fresh fish feed suitable for the species you are growing. While many substitute with live feeds like worms, grubs and vegetable matter, this can, at times, cause water quality and fish health problems and should be used sparingly to add variety to their diet. Fish prefer to be fed in the shade of the morning and evenings if outdoors and you will find they will respond to keeping the feeding times consistent. Your fish will develop a habit of looking for the feed at the times when you feed and if it is not there when expected; it will set up aggression in the tank, especially with the carnivore species like Murray Cod and Barra. So keeping the feeding simple and regular is a good start to getting them fat for the table. 5 How many fish will you eat? With a firm understanding of what your fish expect of you, it is also a good idea to understand what you expect of the fish and how you can achieve that wonderful goal of eating your own fish, fresh from your tank. Firstly, how many fish you eat now and how much you plan to eat is a great question to get this discussion going. The World Health Organization recommends an intake of 1–2 servings of Fish per week per person. Let’s say you have a family of four, it is recommended you eat approximately 4 fillets of fish per week. This would mean you need to grow around 100 fish per year or 50kg to supply your family of four a meal each week of the year. What does it take to grow 50kg of fish? Assuming you have the right species and temperature, oxygen and water quality will be the primary considerations in the design of your system, with the amount of feed per day being the limiting factor. The following will give you some pointers the help. First it is important to understand the effect feeding your fish has on the entire system. Every kg of fish feed you give to the fish will consume approximately 1kg of oxygen in a well filtered system and up to twice that where the solids are not removed. This will affect how many fish you can support in any given system. Let’s take a closer look at that 100 fish or 50kg. Once they are at harvest size, you will be feeding at 1% per day or approximately 500 grams of food per day. With that you will need to supply 500 grams to 1kg of oxygen per day. While your fish will be at harvest size it is important to design your filtration/grow beds for this load, even if it is for a short time. 50kg of fish will consume approximately 10 to 20 grams of oxygen per hour, depending on your filtration set up. Typically water saturated with air contains approximately 8mg/L and we want to maintain an oxygen level in the water for our fish at 5mg/L. Let’s take a look at how this affects your stocking density in the table below. As you can see from this table, how many fish you can grow is dependent on the risk you want to take and what sort of support systems you need to keep them alive. The table assumes you are removing solids reasonably well. For those using grow beds as their primary filtration you can effectively add another 30% to 50% oxygen demand on the system which will need an increased flow rate, more aeration or the amount of fish you have will be reduced, either by you or mother nature! If you are starting out and looking forward to getting your hands wet, the green zone in that table is a great place to get going. Buy yourself 20 or 30 fish per 1000 litres (1m3) of fish tank and enjoy learning the art of growing fish at home. Don’t worry about the bloke next door attempting 40kg or 50kg per 1000 litres because you will be able to feed hard and fatten your fish quickly without risk, which is the purpose. More than likely you will have yours to the table before him. After a season or two when you get your first harvest to the table and you are bragging to your mates, you may want to look at having a go at the orange zone in the table, though you will need to be on the ball and preferably have some pre-filtration and/or plenty of grow beds in place along with some aeration. Keep in mind a backup system for power outs because the time to stress or death is much shorter the more fish you have (30 to 45 minutes). The red zone in the table will require even more filtration and skill. It is much easier to simple add another fish tank if you need that many fish and enjoy growing your tasty fresh fish at home with a side of salad and chips. Stock an appropriate number of fish – start low and grow! Most importantly, take some time to learn and enjoy yourself in your hobby and you will be rewarded with plenty of fresh fish and veg year after year. I have a question…. water flow rate is water exchange per hour? Hi Stelios, It is the flow rate per hour (m3). Because the table above is working on a scenario of 1000 liter fish tank, you can call it exchange per hour. Example: 0.3 in our 1000 liter tank would be 300 liters per hour or 0.3 tank exchanges per hour. I just saw your home for the first time. If you are a newbie, then my ms brain fog is muuuch worse than i ever thought, lol. Hey! Some of us newbies gotta bit o brain fog goin’ on and i need all the help i can get, mate! Thank you Paul ! Thank you as always for sharing so openly Paul. Thanks for asking Ludger. Seeking permission is a rare thing on the internet. I will give it some thought. When you have your site up, let me know and we will talk again about it. Would you be interested in translating my book into German. More than happy to print copies specific to language of any country. The math and formula will be in both metric and imperial. lol I know. Should try writting one…. As I said, before xmas at this point is the plan. But family, study, industry and business commitments leave me very little time. But definately working towards it. I am planning for one of the books to be completed before xmas this year. That is the plan anyway. Great Aquaponics-Cheat-Sheet Paul. You article simplifies a lot of tricky variables without dumbing down or spreading myths. Thanks paul, as always very good practical advise, presented vey well.